I’ll admit: I fought the leggings thing for a while. In 2012, I returned to the States after a year in South Korea — and everyone was wearing them as pants. I thought it was ludicrous. Then, I bought a pair for yoga. Holy moly: They were so comfortable. It appears the trend isn’t going anywhere, and since it’s once again legging season in most of the world, I wanted to find out which are best. Which ones aren’t thin and ill-fitting, and instead are thick and luxurious — all on a budget, of course. After polling our office and Facebook community group for their faves, I compiled a list of eight leggings under $20 to purchase and test — plus one bonus brand, which I’ll reveal at the end. I asked each model to review her leggings, and then rate them from 1-10, based on comfort, look and value. Then I averaged the numbers to find a total score and rank each pair from worst to best. 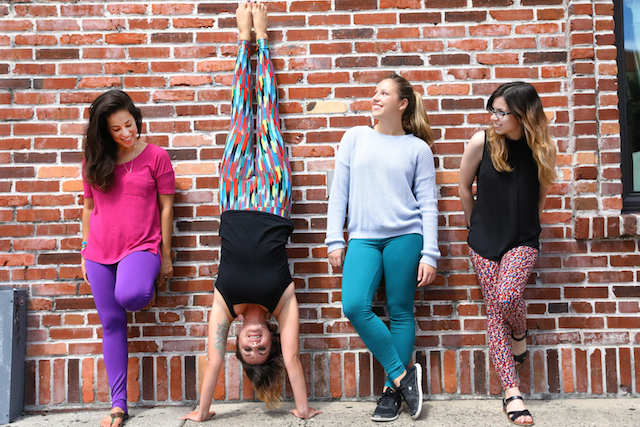 Since I was writing this post, I picked last when it came to which leggings I got to model — and it looks like the other ladies knew what was up (hint: not these). They come in tons of fun colors (even Penny Hoarder purple! ), but that’s where the fun ends. They’re see-through when you bend over, made of a strange shiny material that isn’t very comfortable and are WAY too long for short girls. As much as I loved “The Hills,” LC’s leggings were near the bottom of the list. Though some reviewers described them as the “most comfortable leggings ever,” our model didn’t agree. She got the small length, but they were still too big for her. Oh, and they were the most expensive ones we tested — so even though they might work for taller or curvier women, I’d still recommend you go with one of the choices below. I adore my super-soft No Boundaries leggings from Walmart, but these Danskin ones didn’t do the trick for our model. These were the second most expensive leggings we tried, and though there was nothing wrong with them, they might not be the best value on the list. Who woulda thought you could find high-quality workout leggings at Sam’s Club? These leggings are definitely on the sporty side, but that suited our model just fine. Clocking in at around the same price as your daily latte, these leggings are definitely the cheapest on the list. And, according to our model, they’re worth the price! Everyone loves Target, and our research suggests everyone will love Target leggings, too. We didn’t even have to buy these; our model already had a pair sitting in her dresser. I linked to a similar pair above, but if you want a bigger selection of patterns and sizes, you’ll have to go into your local Target store. Our model loved how comfy and flattering these leggings were. For $12.50 and such cute patterns, I’m excited to give these a try! Okay, I know these leggings aren’t under $20 — but since so many community members and staffers cast their votes for this brand, I had to include it somehow. The few downsides mentioned? The cost: It’s $25 for one pair. They only come in two sizes: regular or tall and curvy, and sometimes the cuts can vary. They also aren’t available in stores, so you must buy them from a consultant. If you don’t personally know any, you can search for one in your area using the company’s website. Or, search LuLaRoe on Facebook, and tons of groups will pop up. When I did this, I found out several friends of mine recently hosted their own LuLaRoe parties. So, they’re expensive and kind of a pain to get — but for real leggings-as-pants aficionados, they might be well worth it. What do you think? Do you agree with my findings, or did I miss your favorites? Oh, and if you live in an area with fall weather, please send some cool breezes down to Florida so I can join in the legging fun! Your Turn: Did your favorite leggings make the list? Susan Shain, senior writer for The Penny Hoarder, is always seeking adventure on a budget. Visit her blog at susanshain.com, or say hi on Twitter @susan_shain. Editorial intern Jacquelyn Pica also did a LOT of the legwork.